I don’t know when this thing started to consume my life. It’s becoming quite ridiculous but I can’t help it. Soon, Jeff VanVonderen will need to step in before it gets even more out of control. The Oklahoma City Thunder is my vice. I began being a fan of the NBA starting my freshman year of college. I started playing basketball a ton at that point in time and began to follow the NBA. No particular team or anything, just a casual fan that enjoyed watching the best athletes of a particular sport do work. When the Hornets were displaced by Hurricane Katrina, I didn’t really jump on their bandwagon, as I knew they would eventually return. When I caught wind of an OKC businessman purchasing the Seattle SuperSonics, I knew it was our team. But even then, I didn’t start to follow the Sonics because they were Seattle’s team so I was back to being a casual fan. I wish I could go back to that. Enter the Oklahoma City Thunder. From the beginning, I was big time into it. No question, I was going to be THAT guy. 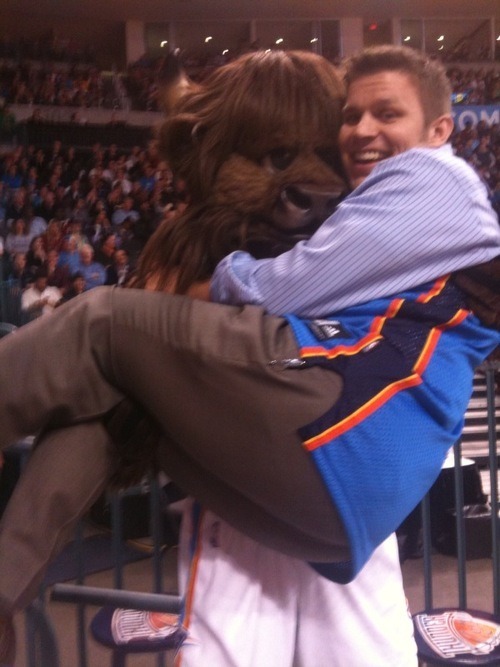 As my friend, Josh Wade is about OU Football, I would eventually be THAT guy for the Thunder. As my friend, Cole Martin is about OSU sports, I would eventually be THAT guy for the Thunder. My orange wardrobe is slowly being overtaken by Oklahoma blue. My sports paraphernalia was slowing moving from Eddie Sutton’s face on a stick, to pennants and key chains with the Thunder logo on it. My John Lucas III jersey I received for Christmas one year was moved further back to make room for my Jeff Green #22 Away jersey. It all culminated last night when, after an amazing win against the Dallas Mavericks to make it our 7th win in a row, I was pulling out stats that the casual fan would not know of the top of their head. I knew what standing we were in in the playoff race and how many games back we were from the next position up (with the win over the Mavs). I’m not sure I can shake this thing. This is having an effect on my life, both professional and personal. I find myself being a little depressed when the Thunder lose. It makes the day after the game that much more upsetting. Work doesn’t get completed with much enthusiasm. I often visit DailyThunder.com throughout the week. I don’t visit it that often after losses. I hate reading recaps of us losing. It just makes for a looonng day in general. My girlfriend is none too happy when the Thunder lose either. Our phone conversations are shorter and there is definitely a grace period that must be given before she asks, “Not Thundered Up?” If the Thunder win out [the next 30 games] I may get a raise AND a wife! I hate that I love you so much, Oklahoma City Thunder. Reward: Which Survivor will win or help participate in winning the Reward Challenge, if any. Immunity: Which Survivor will win or help participate in winning the Immunity Challenge, if any. Voted Off: Which Survivor will be Voted Off or leave the show. Safe: Which Survivor will NOT be voted off during an episode. Mystery Question – The Mystery Question will be a different question each week. The answer to this question will relate to none, one or more than one of the remaining Survivors. Additionally, Mystery Question answers do NOT include activities that occur during either the Reward or Immunity Challenges. You also have a MVP which is a player you stick with from Week 1 and you gain additional points for each challenge they win individually. It’s going to be awesome! If you want to join just go to Fantasy Survivor and sign up for a free account. Our Tribe ID is “9094”, our Tribe Name is “JeffAsksQuestionsThatTieExactlyIntoAllTheTwistsGoingOnWithinTheGameOfSurvivorUnbeknownstToTheTribes” and the Tribe Password is “jeffismyhomeboy”. Additionally, the entry fee to join is $2.00 just to make things interesting. Jeff Probst, the face of Survivor, has been around since the show’s inception and if anyone has tuned into the show, you know Jeff likes to be the antagonist. He’s one to poke and prod every contestant while at Tribal Council. He apparently watches all the video taken of the 3 days between and listens to every conversation (or his crew does) and then he goes on to tell everyone all about them in Tribal Council. If anyone listens during those elimination meetings, I’m pretty sure they can figure out what the H is going on. He’s fantastic at what he does and I enjoy how uncomfortable he makes everyone feel in the room. He’s also got a knack for putting out fires. CHICKEN TETRAZZINI! !